Purchase immediate high quality digital downloads of this 10-track album in your choice of MP3, Apple Lossless (ALAC), FLAC or just about any other format you could possibly desire and save. 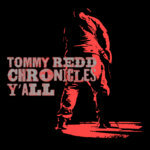 Tommy Redd is a true american hero writing real music for real people. His down to earth lyrics touch the heart like no one else. Most recognized as lead songwriter, guitar player for Nantucket, Tommy is famous for his crazy onstage antics from auctioneer and square dance intros to playing solos with a spoon and slide guitar with a beer bottle.